We arrived in Groznjan on a cold and rainy day and we left on a colder and rainier day. 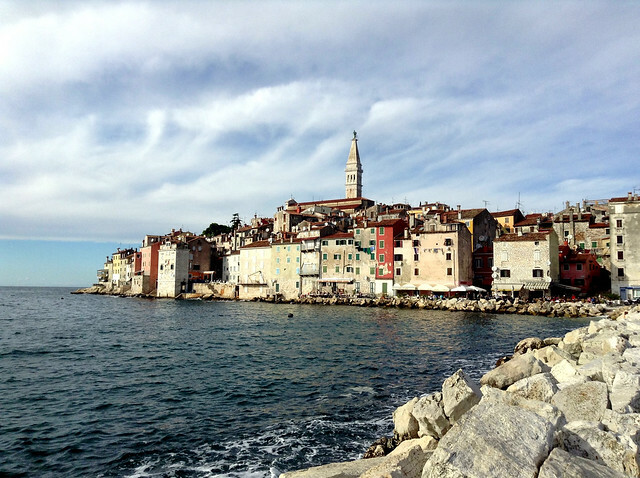 The original plan was to take a cab to the bus stop in Buje and hop on a bus to Rovinj, but once we climbed into the warm, dry taxi we decided to splurge and pay the extra $35 to have the driver and her teenage daughter take us all the way to Rovinj. 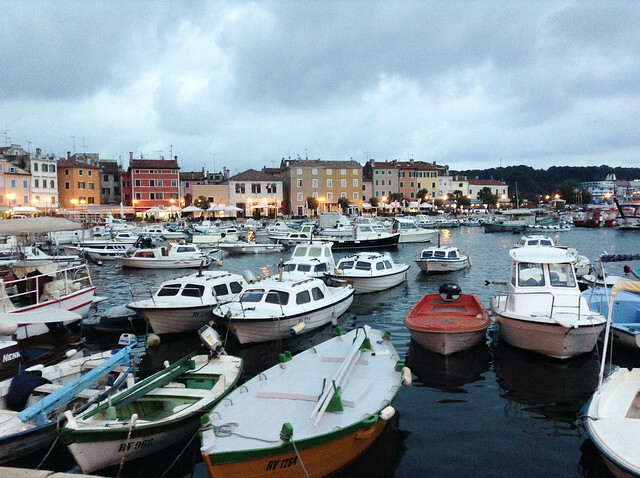 This saved us a 2+ hour wait in the rain at the Buje bus stop and a potentially wet walk to our apartment once we arrived in Rovinj. Sometimes it’s just worth it to spend the extra dough. 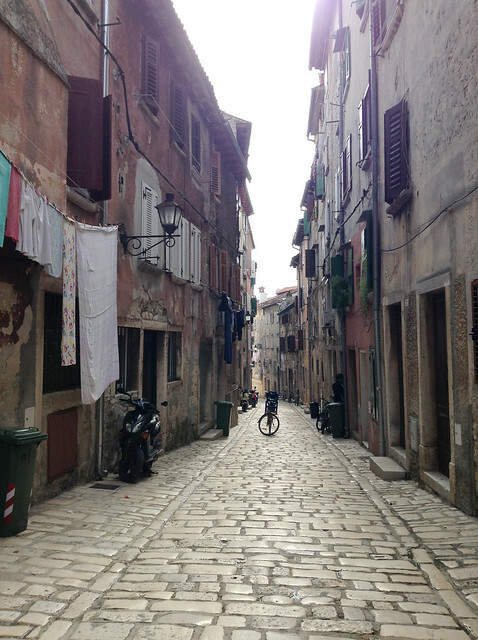 The rain stopped by the time we arrived in Rovinj so we dropped off our bags at our AirBnB apartment and went out for a walk to explore the old town. Since we stayed in the heart of the old town we were able to explore a good amount of it the first evening. The port and the old town in the background. I’m convinced that these innocent looking pedestrian walkways were designed to kill a few tourists every season. The old part of town, where most tourists stay, is quaint and charming. Its pedestrian streets are all slippery stone, perfect for killing the hordes of elderly cruise tourists who descend upon the small town every summer. If you do manage to survive the walk through town then you can enjoy listening to the romantic saxophone musician who plays everything from Broadway show tunes to The Jackson 5 while you dine al fresco with your beloved. 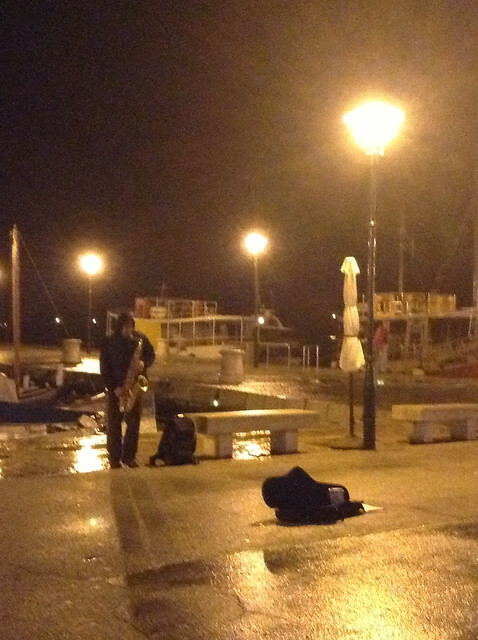 A sax player with a giant saxophone. 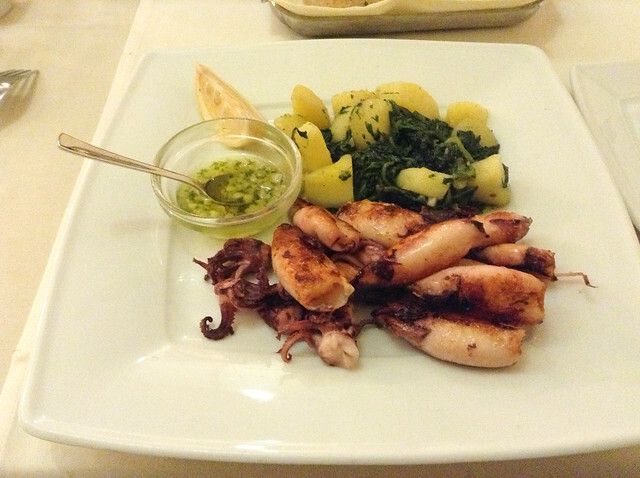 I ate grilled calamari while the sax player serenaded me.